There can be many reasons for having your air ducts cleaned that are clearly visible and deserving of attention. When tufts of dust and debris begin to be blown out of your ventilation system, rodent infestations, or strong odors emanating from your air ducts can all be telltale signs that you should have the area professionally looked at. ​Though for general air duct cleaning, then the trust of the matter comes down to whether or not you feel it’s time for this area of your home or business to receive attention. As with any surface on your property, there comes a time when everything needs to be cleaned in one way or another, and though not having your air ducts cleaned out for long spans of time generally won’t lead to any adverse health effects, it is still recommended to have the procedure done here and there to keep your airways clear. There are genuine benefits that come with getting your air ducts and vents cleaned, along with the machinery that drives them, such as your air conditioning unit and furnace, to ensure that you are operating with clean and clear machinations within your property keeping the paths flowing. New Braunfels Air Duct Cleaning Pros will never pressure you into getting an unnecessary service done, and will give you up to the minute information on the status of your air ducts to allow you to make an informed decision. Is The Air Duct Cleaning Equipment Safe For My Air Ducts? Yes. New Braunfels Air Duct Cleaning Pros has been in the business of bringing high quality air duct cleaning to New Braunfels and the surrounding area, and would never employ a cleaning measure for your home or office that wasn’t 100% safe and effective for your air ducts. The method of air duct cleaning that we employ is gentle to your air duct materials while being thorough in removing build up and blockages. We have been in the business of bringing professional quality air duct cleaning to the New Braunfels area for many years, and that service and reputation that we have built our business upon would not have been able to last if we delivered an inferior product. We bring you the most detailed and thorough cleaning in the air duct cleaning market to ensure that you are continually on top of every step being performed by our professionals and having the information at hand to know the efficacy of the service we provide. At New Braunfels Air Duct Cleaning Pros the health and security of not only your home, but the air ducts within it is our number one priority, and we continually take every step to ensure their proper care. When choosing New Braunfels Air Duct Cleaning Pros as your air duct cleaning professionals, you can be sure that we bring the full weight of our experience to bear on your property, and take every step to ensure the safe operation of all cleaning equipment while on site. Though knowing the potential investment cost of your air duct cleaning work would be helpful in the course of making a decision as to whether to look into having your air ducts cleaned, it would be amiss and irresponsible for us to assume that we could give you an accurate estimate of the service without physically seeing the location. There are many factors that come into play when it comes to your air duct cleaning, such as the number of ducts, the level of blockage, whether there is any physical repairs needed, whether there is a chemical application needed such as in the case of mold growth and more. It is through all of these factors that our professionals give you the ultimate estimate on what your air duct cleaning service will cost and only by being able to be on sight and overlooking the status of your air ducts is it that we can give you an accurate estimate. At New Braunfels Air Duct Cleaning Pros we are dedicated to bringing you transparency in our service, and that includes the periods of estimates, as we always intend to give you the most accurate assessment up front and sticking to that estimate cost. We know that the market has been filled with less than scrupulous offerings as of late, and we aim to change the landscape of the air duct cleaning service by bringing you correct and professional pricing for a quality service that you can rely on in every step of your air duct cleaning. What Process Do You Use To Clean The Air Ducts? New Braunfels Air Duct Cleaning Pros uses a two step approach when it comes to cleaning your air ducts. The first being a brush inspection that gets deep within your air ducts to give us the most accurate up to the minute status report of your air ducts. This keeps anyone from being surprised at the level of dust and debris that hides around the next bend in your air ducts. While performing this process you will also have access to the visual assessment so that you can see for yourself the exact status of your air ducts, removing the possibility of having work falsely flagged to run up your costs. The second step is using our brush equipment that clears dust and debris through contact cleaning, brushing the build up off the side walls of your air ducts and gently vacuuming it away. This keeps all dust and debris at its source and removes the ability for any of it to backtrack into your home or business. Through this two step approach New Braunfels Air Duct Cleaning Pros brings you the most efficient air duct cleaning in the region. We believe in bringing you the most accurate information when it comes to all steps in our cleaning process, which is why we provide you with a copy of the video documentation of your air duct cleaning before, during and after. We are dedicated to bringing you the most accurate service within the New Braunfels area. Does The Air Duct Cleaning Process Create a Mess? No. 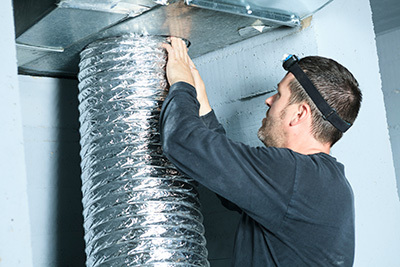 The air duct cleaning process carried out by New Braunfels Air Duct Cleaning Pros is all about keeping the build up inside your vents and removing it from that location. Our brush equipment is designed to remove the build up from the sides of your air duct walls while the vacuum portion of the equipment gently removes it. This keeps the built up dust and debris from making its way back through your air ducts and into your home. While some dust may make its way out of areas closer to the ends of your air ducts, this is relatively minor and nothing to worry about. When choosing New Braunfels Air Duct Cleaning Pros as your air duct cleaning professionals, you can be sure that we take every step to ensure that we bring you not only a thorough cleaning service, but one that tackles the problem at the source and keeps it there to keep your air clean and clear. We have been in the business of performing professional air duct cleaning service for the New Braunfels area for years, and have had the experience and opportunity to perfect or craft, bringing you a safe and reliable cleaning measure that has the least amount of impact on your home or business. When choosing New Braunfels Air Duct Cleaning Pros as your air duct cleaning professionals, you can be sure that you are investing in experience and expertise when it comes to the craft. How Long Will The Air Duct Cleaning Process Take? The length of time necessary to perform our professional air duct cleaning service is highly dependent on the size of the building in question. For your average home with an average amount of air duct and machinery cleaning, you can safely assume that the process will take between two to four hours. For multi-level or larger homes, more time will need to be added to accommodate for the size, but generally the entire process can be completed within one work day. For businesses in the New Braunfels area, this amount of time can be longer depending on the size of the building as well. For small shops such as general repair stores, or small restaurants, the process again can be completed in a short number of hours, but when dealing with larger businesses and office buildings, this can be a venture that can occupy a few days. At New Braunfels Air Duct Cleaning Pros we always aim to bring you a non intrusive service that is completed as soon as possible, yet we always aim for the most thorough job completion you can expect, which of course can take a little more time. This is one of the main reasons why we charge by the site and not by the hour, as this leaves your coverage cost the same even if our service winds up taking longer than expected. We take every measure to ensure that you get the most thorough finished product in the city, while keeping your schedule in mind. 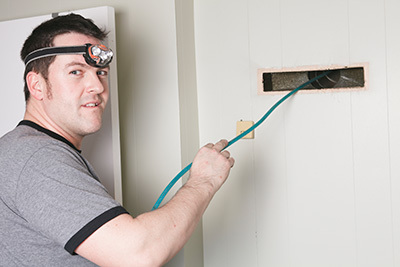 Is It Okay To Be Home During The Air Duct Cleaning Process? The process that New Braunfels Air Duct Cleaning Pros uses to clean your air ducts leaves the rest of your home perfectly safe to be within during the air duct cleaning process. The measures that we use in providing you with your air duct cleaning is aimed at keeping the materials within your air ducts to be vacuumed away during our brush process, and leaving the rest of your home free and clear of dust. During this period the air conditioning or furnace system of your home will need to be turned off, for a number of reasons, one being to ensure that the air doesn’t begin to flow through your vents again and pushing all of the build up materials directly into your home. As a result of this, the temperature in your home may be affected depending on the day, but that is about the highest level of discomfort that there will be. New Braunfels Air Duct Cleaning Pros professionals are there to provide you with a high quality cleaning, but take every step to ensure that the intrusion level to your day is kept at a minimum while possible. There may be loud levels of noise from the equipment in use, which as well can cause some level of discomfort, and especially for those with infants in the home, but you can be sure that New Braunfels Air Duct Cleaning Pros takes every step possible to ensure that the quality work we provide is as non-intrusive as possible. At New Braunfels Air Duct Cleaning Pros we ensure that you always get the most for your investment, and when it comes to the proper licensing and insurance coverage for our work, you can be sure that we take every measure to ensure that you’re well covered. We believe that it would be amiss for us to call ourselves a transparent and qualified company without these offerings and thus ensure that we are continually up to date on all of our coverage. When choosing New Braunfels Air Duct Cleaning Pros as your home or business air duct cleaning service, we want you to have the peace of mind in knowing that you are obtaining the services of a company that takes every possible step to ensure that you are getting the most value for your investment, and continually aiming to bring you a dependable service for the New Braunfels area. If you insist that your company is up to date on all their coverages while providing affordable and dependable service, then we invite you to try New Braunfels Air Duct Cleaning Pros.